Truth be told, over half of the desserts I make when I’m alone at home look like they were pooped out of a woolly mammoth and left to fossilize for a few dozen centuries under mountains of snow. That’s one of the big reasons why food blogging is such a godsend. Making delicious stuff that looks like elephant dung, deeming it unpresentable to the public eye, and eating all the evidence so that nobody ever finds out you’re a big food phony with zero presentation skills…well, that’s kinda my specialty around here. Then every once in a few Ice Ages, you uncover a real gem. A dessert that is absolutely horrendous to look at–something between burnt toast and your Aunty May’s leftover fruitcake–but tastes like a million bucks, and then some. This bananas foster bread pudding is exactly that. So ugly and so, SO insanely good. Maybe you should bring it to your next ugly sweater party just so you can fit the theme! I may have been cringing when I brought this bread pudding to our most recent holiday party, but you can bet your fancy pants that I was a proud pudding parent when I left that evening. I’ve gotten multiple recipe requests for this and everybody’s mind was blown by the boozy factor in an otherwise innocuous (and yeah, ugly) potluck dessert. You’ll want to make this! What’s your favorite ugly dessert? 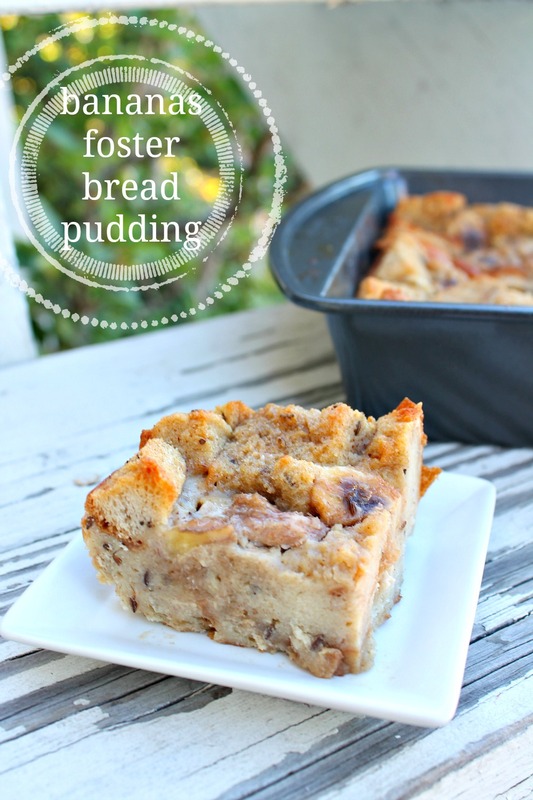 It may not be much to look at, but this bananas foster bread pudding will be THE smash hit at your next party! Creamy, rich bread pudding meets its boozy match with coffee liqueured bananas foster. Preheat oven to 350 degrees F. Lightly grease the bottom of a casserole or 8x8-inch baking pan. Sprinkle bread evenly across the bottom of prepared pan. To make bananas foster: Heat all ingredients (except bananas) in a medium saucepan over medium heat until mixture comes to a boil. Add bananas and allow them to warm in the mixture for 1-2 minutes. Transfer bananas to the prepared pan; drizzle about 2-3 tablespoons of the sauce over the bread as well. In a medium mixing bowl, combine eggs, cream, sugar, cinnamon, and vanilla. Pour mixture over bread cubes, using a fork to press down cubes as needed. Make sure all bread is soaked. Bake in preheated oven for 35-40 minutes, until the showing corners of bread are lightly toasted and the top springs back when lightly tapped. The interior should still be creamy (but not liquidy). Cut and serve immediately! Want more amazing last-minute holiday recipes? Check out what the wonderful folks at Sunday Supper are sharing this weekend! I make so many ugly desserts, but I have this theory that the ugly ones taste the best 🙂 This certainly isn’t ugly, but I bet it’s still delicious. hahaha thanks for your generosity, Laura! Totally appreciated. I’m sure your desserts are GORGEOUS, girl! I’ve seen ’em!! One of the first desesrts I made for my family growing up was a panatone bread pudding. it’s seriously so good! I can’t wait to try this! yeah!! I just looked up “panatone bread pudding” and OH my word. I’ll be making that too this year!! You always crack me up, Ala! I am a huge bread pudding fan and yours looks mighty fine to me. Tan and brown foods are nearly impossible to make pretty! hahaha so true! At least they taste delicious. HAPPY HOLIDAYS, Liz!! In stitches reading this post! Haha…. pooped out of a woolly mammoth. HA! I think you are pretty clever making bread pudding look this yummo, I gave up making it in restaurants I worked at, because it never presented nicely, and no matter how much convincing I put in, people took one look and said ‘no deal’, sighhhh! Totes giving this beauty a whirl, and if anyone questions me, I will repeat your hilarious description to make them forget. Hope you are well sweet lady, enjoy your Christmas if I dont get back here before then. THANK YOU so much for this heart-warming, fuzzy comment, Anna! Let me just be the one to say that I am lucky to have met a kind soul like YOU! Here’s to 2016 and lots more friendship adventures to come!! This is THE dessert I need to make for my husband who loves both bananas foster and bread pudding. Amen, Renee! Your husband sounds like he has amazing taste 😉 happy holidays!! That’s the story with most of the desserts that I make – they taste much better than they look! The individual piece of that pudding actually looks really good! You’ll just have to cut all of it into individual servings before presenting it 🙂 I love how there are the actual pieces of bananas as opposed to all mushed up bananas hidden in the dough! hahaha thank you–yes, individual servings work wonders for a dish’s appearance, don’t they? Thanks so much for the encouraging words, Melanie 😉 oh, and HAPPY HOLIDAYS!!!! Never met an ugly dessert that powdered sugar didn’t dress up. 🙂 This looks terrific — I just love bread pudding. No powdered sugar needed for this! Yes, I should’ve thought of that–well, I’ll be applying that knowledge to this holiday’s desserts for sure! 😉 happy holidays, John!!! Bread puddings are a favorite in my house (no matter what they look like) but we have never tried a bananas foster version. Going on the list! Merry happy everything, Ala! haha! Your family has good taste, just like you do 😉 HAPPY HOLIDAYS to you and your family, Kate!!! Bread pudding is GOLD after the holidays – we have so much brioche, challah and panettone around that just go stale! yes yes yes! I am making SO many bread puddings after the holiday. And happy holidays to you, Sarah!! 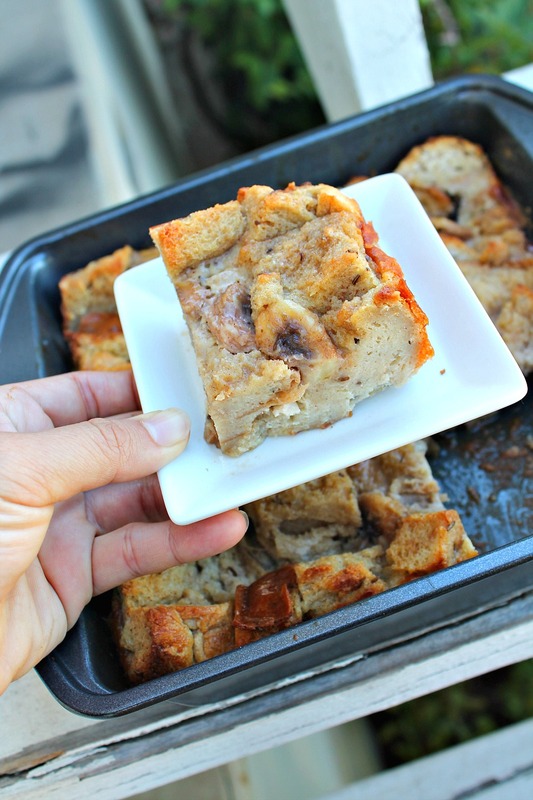 Mmmm I love love this bread pudding, sounds so good! Happy Holidays & Merry Christmas Ala! My husband would about die if he saw this!